With Lyons BF and Reims dominating LF2, the basketball news columns concentrated on the fact that Lyon has changed their playing kit once again. They presented the tunics to the press earlier during the week and wore them for the first time in an official game against Pleyber-Christ. Pleyber-Christ fell at home during week 6 to Reims (65-72) but were completely destroyed by Lyon in the latest round of games (52-93). All ten players from Lyon scored with five of them finishing in double digits. Pleyber-Christ just had a bad game in which they turned the ball over 34 times. Reims made it seven wins out of seven with a difficult home victory (62-52) against Armentières. Roche Vendée are the only other team in the Ligue Féminine 2 that - at the moment - stay on the tail of Lyon and Reims. They held off Elan Béarnais Pau Lacq Orthez (59-56) with 21 points coming from Christelle Morel to stay in third place. After seven weeks of action there are just two games separating Limoges in 4th place and Dunkerque currently laying in 11th place. Three of the four clubs currently in the relegation were promoted last season from the third level of French basketball: Elan Béarnais Pau Lacq Orthez, Le Havre and Perpignan. The fourth team in the relegation zone is Illkirch-Graffenstaden (SIG) who were walloped by Nice (62-92). Nice had the game won by half time leading (53-26). 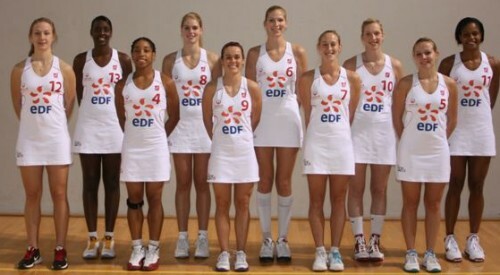 Swanne Gauthier who played in the LFB last season was the player of the match with 16 points, 9 assists and 7 rebounds. The SIG are finding the going tough this season with just two wins from the first seven games.